I’m reading the book Scorecasting by Tobias Moskowitz, a Chicago professor, and Jon Wertheim, a writer for Sports Illustrated. 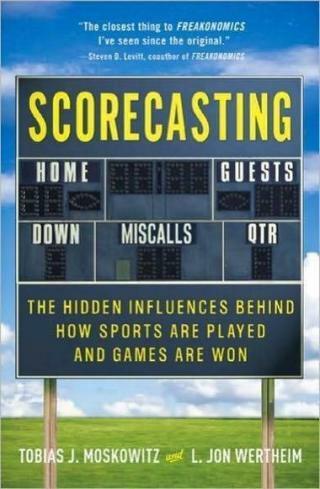 It’s being billed as the Freakonomics of sports. The popular book Freakonomics was about applying economic concepts to every day life, in terms that the masses could understand, using some pretty shocking examples. 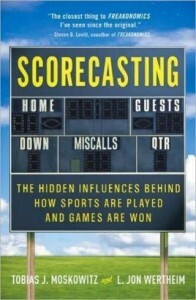 Scorecasting is less shocking, more obvious, but still fascinating fodder to brew on. One chapter titled ‘Tiger Woods is Human’ elucidates that Tiger putts the same as any other golfer (albeit more accurately) and demonstrates the same faulty decision making that all of us make. The faulty decision making is loss aversion. People absolutely hate to lose. They will do all they can so they won’t lose, if that means thinking harder, concentrating more, willing themselves to escape defeat. Every movement, every decision, every sub-decision is made ever more carefully if you are one step away from losing. Now if you’re ahead, even ahead by a little, your focus simply isn’t the same. The chapter’s main example was Tiger’s loss during the 2009 PGA Championship. He was favored, he was ahead. He had nothing to lose. But he did lose, essentially to an unknown Korean named Yang who fought tooth and nail with every putt. All of this makes sense. The economics is obvious and sensible. Can you imagine how great we could all be if we thought we were always losing?